When Brian C. Petti emailed me about reviewing his new ebook, Sister Mercedes and the Temple of Doom, I was pleasantly surprised by him sounding so... normal. No bureaucratese, no marketing gibberish, simple human-to-human communication. I was instantly taken by the book's title, too, and even though it had to wait its turn (did I tell you how pedantic I get when it comes to reading order? ), I was looking forward to the moment when I was finally free to check it out. Guess what, the moment came and disappointment did not follow. 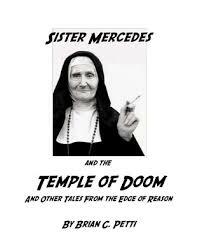 Sister Mercedes and the Temple of Doom is a pleasant little booklet (slightly over a hundred pdf pages), composed of posts from Brian's blog, pettiplays. Undeniably funny, it sparkles with hyperbole and dynamic storytelling. As blogs tend to be, it is mainly autobiographical, recording joys of bringing up a family and developing writing career while struggling with disabling illness. The Petti family is instantly likeable, especially when viewed from the author's too-honest-for-his-own-good perspective. Petti's Life of Brian is messy, chaotic and sometimes overwhelming which makes it also refreshingly believable. I found it hard to relate to some of the book's tales. I have no children, and there's lot of parenting in there. References to American pop culture are wasted on me altogether and unlike Brian, I don't fancy theater. Here, lively writing saves the day. I might not give a drat about the subject matter, but I'll still laugh at the jokes. Me too, I also hope it brings him fortune and fame. But I know Brian does it for the pure love of writing, to our delight.